Recent events in Tunis, Egypt, Bahrain, and now Libya threaten to overshadow the Iranian election of 2009. The Green Wave sets out to make sure we don’t forget. You may remember the news from Iran in 2009. There were large protests leading up to the election. The party in power won by a suspiciously large margin. The results were questioned, and there were many protests immediately following the election. There was a subsequent violent government crackdown on the protestors. If you read the Wikipedia page on the election, you will get a very cool version of events. If you watch The Green Wave, you will get something hotter. 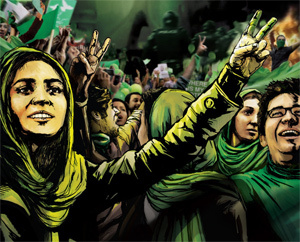 The sources in The Green Wave are blogs and tweets coming from the ground in Iran. Animated segments illustrate those posts and tweets. Cell phone footage, when available, is “arted up” so it doesn’t look so bad on a big screen. Where possible, high quality footage of rallies and protests is included too. The animation works flawlessly — it’s not distracting or showy, rather it supplements the text-only source material used by the filmmakers. The various posts, tweets, and scenes of rallies are strung together in fictitious storylines read by two first-person narrators. I’m not a fan of fiction, recreations, or reenactments in documentaries, but then again, if you had to make a documentary based on text found on the Internet, I’m not sure you could do better than Ali Samadi Ahadi did here. The Green Wave is an emotional rollercoaster, and it tells the story of the election simply and clearly. It starts before the election, when throngs of people gather in Teheran to show support for Mousavi (his signature color is green). When election day comes; our narrators are nervous, yet hopeful and joyful. Then there are ominous forebodings when the polls close. Instead of election coverage, the national television network only shows nature documentaries. Text-message services are shut down, web sites are blocked, candidates are arrested under false pretenses... and then Ahmadinejad is declared the winner. Over the next few days, peaceful protesters march and ask “where is my vote?” Before long, thugs on motorcycles and in military gear break up the demonstrations and start beating bystanders. People are killed, illegally jailed, and tortured. Meanwhile the nation’s top cleric calls the peaceful protestors “riffraff” and publicly supports Ahmadinejad. The Green Wave is a very moving documentary, and more timely that it could have possibly known. It should find an audience heartened by the democracy protests in the Arab world in 2011. At the same time, the documentary is almost eclipsed by recent events — you wish the movie could somehow acknowledge that it is part of the current events in the Mideast. The fact that it doesn’t know of Tunis and Egypt almost — but not quite — makes the film feel dated.